Featuring elegantly planned and luxuriously furnished rooms, Sheraton Maldives Sheraton Maldives Full Moon Resort & Spa is an affordable 5-star family getaway in 15 minutes by boat from Male airport. Welcome to paradise. With everything you might expect from your sun soaked holiday to the Indian Ocean, the newly renovated Sheraton Maldives is positively picturesque and surrounded by calm blue seas. The world renowned brand is not quite as natural a fit for the Maldives as W but it exudes a solid affluence and makes a guest feel special on the small island with a rustic atmosphere. 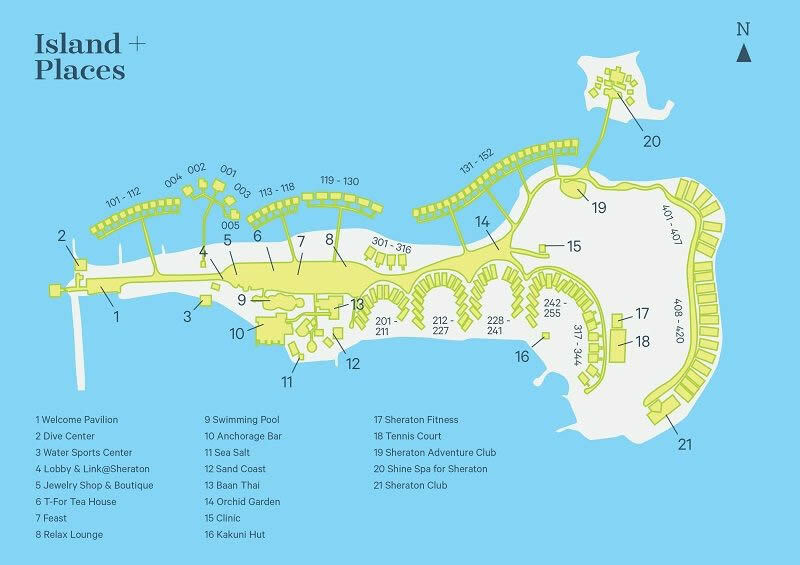 With exellent location in North Male atoll, the luxury resort has 176 rooms, Shine Spa, a modern fitness center with a tennis court, a dive center, free non-motorized water sports, a children's club and a lagoon-style swimming pool, and a fine collection of bars and restaurants. With its close proximity to the Maldivian metropolis - it's the perfect upscale choice (with all options) for everyone who wants to mix their holiday with one or two trips to Male, or just to stretch their vacation hours as much as possible. The brand is very strong in Asia and so not surprisingly Chinese make up the largest percentage of guests, with quite a number of Koreans, Japanese and Russians too. Having said that, it is also popular with British guests and some other Europeans. The fact that the resort is just 15 minutes by boat from the international airport plays a part, as guests on the night flights to and from Asia can transfer straight to and from their resort rather than stay over a night in Male or Hulhule. 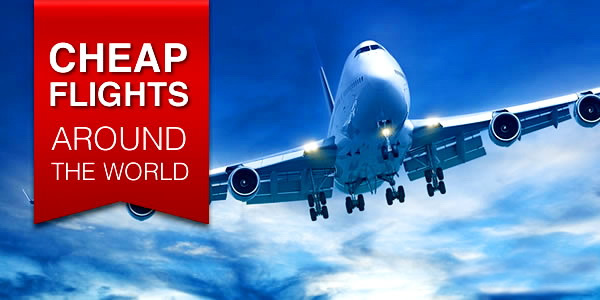 Furthermore, when your holidayholiday is just 3 or 4 days long, you want to spend as little time as possible in transit. When you stay at Sheraton Maldives, the luxury keeps getting better. When Sheraton took over Full Moon a huge investment was made to an already good resort. The staff members were kept on, so all the many repeaters continue to be greeted and fussed over by their favourite personnel, but the staff skills and standards were raised considerably by the training and the systems that Sheraton bring with them. Now there’s a truly impressive level of attentive service. While you are definitely exploring the paths and exchanging places with other guests, the resort somehow still feels private and spacious, like some boutique hotels, and even at almost full capacity it's fairly easy to find your own place under the sun somewhere on the island, where you can laid back and relax. An exception here is the time of food intake, when it can feel like a real zoo - mainly in Feast restaurant. As the resort adapts a fair amount of menu items with seasonal demographics, picky eaters can ask ahead of time and accordingly plan their trip. There are fewer than a handful of Maldivian resorts that are less than 30 minutes by speedboat from Male airport, and Sheraton Maldives Full Moon is one of them. 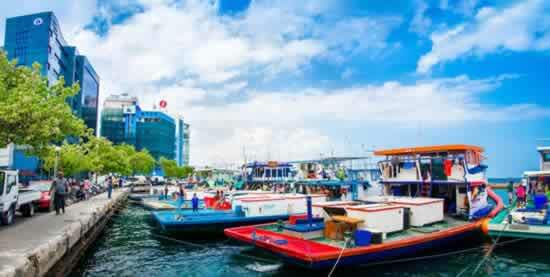 The cost for the combined roundtrip transfer service from/to Velana International Airport is $136 per person. Located on the private island of Furanafushi in North Male Atoll the resort is surrounded by distant views of neighboring islands and is conveniently located within 20 minutes of popular snorkeling sites like Aquarium Reef. Its ultra-close proximity to the capital city of Male makes it an ideal spot for anyone who wants to mix in a little local flavor with their resort experience. 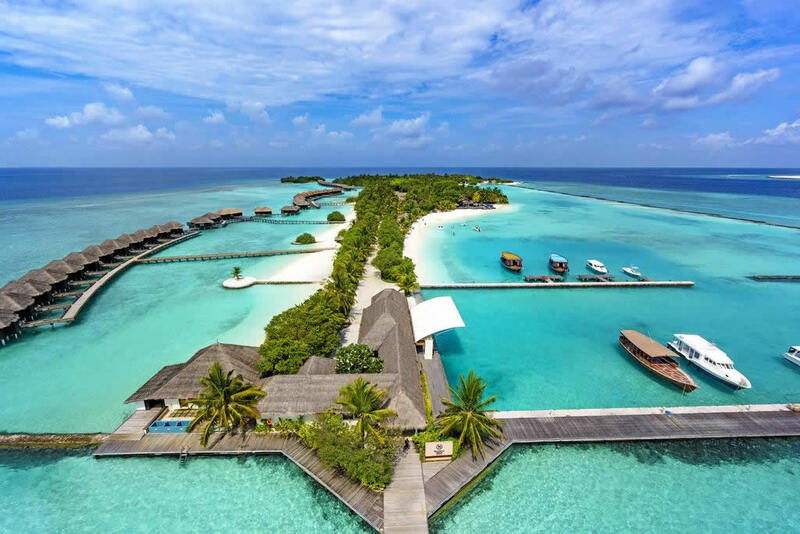 After renovation in 2018, Sheraton Maldives Full Moon Resort & Spa boasts 10 different luxury room categories, all spaciously located around the island, including the re-styled Deluxe Cottages, Cottage Water Bungalows and Water Bungalows with Pools. These spacious cottages all offer the utmost privacy and provide easy access to the beach and lagoon. As part of the renovation, they now feature an outdoor so guests can truly immerse themselves in their luscious green surroundings. 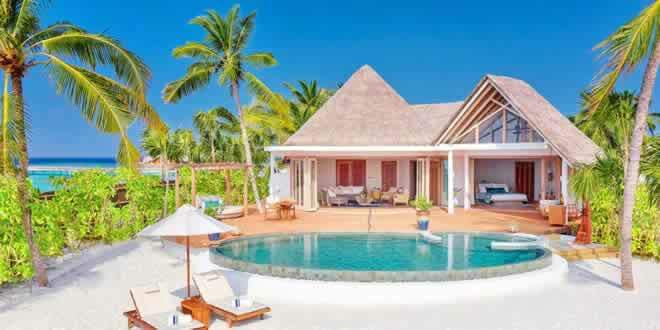 In 2019 Sheraton Maldives Full Moon Resort & Spa has launched its exclusive villa host service. Now available across all 10 luxury room categories at the newly transformed resort, each guest is treated to a private villa host who is responsible for ensuring every need is well catered for to create a tailored and unforgettable five-star experience. Each couple, family or solo traveller is met with one villa host as their main point of contact for every requirement. As such, villa hosts quickly come to understand their guests and can often anticipate their thoughts and requests in advance. This is all carried out through a very subtle demeanour, meaning guests are still left in undisturbed privacy with the knowledge that help is at hand, should it be needed. The property has also introduced a new room category, Cottage with Pool, which has been designed with families in mind and boasts a private plunge pool for young children to safely splash around in with direct access to the heavenly white sandy beaches. Overnighters in the top two categories, Ocean Pool Villa and the Water Suite, are granted access to the exclusive island club, home to happy hours, mixers, an additional pool, and some great views of rolling waves. In addition to club access, the Ocean Suite (a big overwater villa) also has a stone whirlpool and bidet, while the Ocean Pool Villa -- the largest of the bunch -- comes with a big, private back patio overlooking the rocky coastline, where you can expect an outdoor plunge pool, outdoor shower, relaxing hammock, verdant landscaping, and patio furniture. The room interiors are, without exception, lovely. The colour palette is full of the warm, earthy colours with turquoise highlights on a clean white base. The furniture and soft furnishings are modern, rich and comfortable. Every room has the signature Sheraton Sweet Sleeper Bed and, most unusually and usefully, an iron and ironing board. Designed for those wanting extra space and privacy, the thatched-roof Island Cottages offer a comfortable island experience. Each king-bedded cottage features vaulted ceilings for an even greater sense of space as well as a daybed and private balcony ideal for lounging. Individually controlled air-conditioning and a ceiling fan will allow the space to remain cool and comfortable. A Sony 40" LCD flat screen television offers a choice of local and international channels, and guests can set the mood with a CD player. Each cottage is equipped with electronic safe; tea and coffee making facilities; in-room mini bar with a selection of beverages and snacks, as well as High Speed Internet Access. The bathroom boasts an open-air shower that still maintains privacy, a separate bath perfect for soaking and Sheraton's Shine for Sheraton™ bath amenities. The biggest structural change was the building of 20 new rooms on the east side of the island where there were no rooms before. These are the new prime rooms and by some way the largest and smartest. The interiors are contemporary and handsome but their real selling point is the large deck with plunge pool, hammock, dining area and seating. Even more to the point is the unfettered view across the breaking waves and out across the endless sea. Facing due east, there is nothing but blue until Indonesia. On the downside, the open ocean means being very wary of waves and currents. Indeed, this is the site of the acclaimed surfpoint Furanafushi. These rooms are for those who prefer to sit back, enjoy the luxury and look. Nearly half the size of the Ocean Suite, the Beach Front Cottage and Island Cottage are the most ideal for those traveling with kids as they are the largest rooms that allow children. (Children 11 and under are not allowed in the overwater villas or bungalows, or Ocean Pool Villas). The standard Deluxe Rooms are located beachside and have tiled floors, CD players, coffee- and tea-making facilities, and stocked minibars. This is the only category with a two twin bed option; all other rooms come with king size beds. A number of the beach rooms are ideal for families, with interconnecting doors and the space for extra beds. The resort really puts itself out to be child-friendly by not charging for extra beds or the children's food, under a certain age. The Adventure Club is also free for children between age 4 - 12 and is open all day with well thought-out programmes that reflect the preferences of the clientele. Children below the age of 3 need to be accompanied by one parent and babysitting is available at a charge. There are, it has to be said, a lot of rooms for a 5 star resort on a small island. The seclusion of the ocean villas contrasts with the more busy views of the beach rooms. Most of them face south for all-day sunshine but also views across lagoon walls to boats and the lights of Male and the airport. The water villas face north, which is not ideal for sun on their decks but the vistas are beautiful and uncluttered. The 44 Deluxe Rooms at Sheraton Maldives Full Moon Resort & Spa were designed and built by local craftsmen. Carefully chosen floors and timber blinds enhance the warm and welcoming feeling of each room. Stay cool in the tropical heat with both individually-controlled air conditioning and ceiling fans. The bathroom features a tiled shower and generous vanity. A Sony 40" LCD flat screen television with a choice of local and international channels, and a CD player is provided for your convenience. Each room is equipped with an electronic safe as well as tea and coffee making facilities and an in-room mini bar with a selection of beverages and snacks. High Speed Internet Access is available in all guest rooms. Top accommodation of Ocean Pool Villa and Water Suite will give you access to an exclusive island club a home with happy hours, mixes, an additional pool and magnificent ocean views. Imagine your own chic, contemporary Maldivian-themed beach house tucked in the eastern end of the island for ultimate privacy. In addition to club membership, Ocean Suite also has a stone bathroom and bidet, and Ocean Pool is the largest of the heaps, is equipped with a huge patio overlooking the rocky coastline, an infinity pool, an outdoor shower, a hammock for relaxation, vegetation and furniture. Whichever direction you choose to go, the soft white sand is merely steps away, inviting you to lay out a blanket or lounge on sunbeds. Occasionally, the shallow waters play host to harmless stingrays and baby sharks, inviting guests to observe them up close or snorkel alongside these amazing creatures. Though most all of the rooms have direct access to the lagoon or a sandy beach area, Sheraton Maldives does have a nice-sized public beach area as well. This sweeping, sickle-shaped stretch of white-sand beach and turquoise water runs about half the length of the island's south side and gives guests easy access to crystal clear waters and shallow sandbank snorkeling. Solid, well-built, white wooden loungers are topped with tawny cushions and line the beachfront, while the occasional in-water sign reminds guests not to touch any of the rays that tend to frequent the shallow waters. If you get hungry on the sands, there's a beachside bar and restaurant just a few steps away. Aside from heading to its beach area, if you want to get wet at the Sheraton Maldives, you'll have to make for the pool. A little on the small side for such a large property, the lagoon-style pool has a relaxing garden setting with a nonetheless lively vibe. To one side, you'll find a little wooden bridge (that heads to the lobby) with a gushing waterfall, and to the other, a smaller, shallow kids' pool. The pool itself is surrounded by a stone tile deck with padded wooden loungers, umbrellas, and (usually) lots of lingering guests. Not surprisingly the restaurants are top class. There is not much in the way of snorkeling around the island, so this resort is really about the pleasures of the senses: the sun and water on your body, the spa treatments, the good food, luxurious surroundings and attentive service. For a small island, Sheraton Full Moon has a nice selection of international-themed cuisine restaurants with specific menu items that adapt to match the demographic of the resort’s many different tourist seasons. For breakfast, a diverse buffet is served in FEAST. Items on the line range from Western staples like pancakes, waffles, and an omelet station; to country-specific dishes like congee, bao, and curries. There are also healthy picks and a few sugar-free and gluten-free options. At breakfast or dinner, your passion for food comes to life in this uniquely interactive experience, where there’s a new one to be had everyday at international theme dinners rotating all week long. The newest addition to the completed renovations includes the centrally located Feast Restaurant, which has been uniquely designed to emulate the local culture and now boasts a cadent coconut roofing and a sophisticated white colour scheme. Though Feast is closed for lunch, guests can choose between a la carte options like barbecue seafood dishes, sandwiches, fresh juices, and salads served at the beachside picnic tables of Kakuni Hut. Kakuni (Locally Known as Crab) Emerges from the beautiful view of the lagoon and offers a great casual all day dining alternative. Homemade salads, juicy Crab burgers, a variety of pasta and locally inspired dishes , Kakuni Hut serves your favorite drinks, delivered right to you as you relax on the beach with friends and family. An Upscale Asian and international dishes like Maldivian tuna tartar or quinoa salad inside the open-air palapa, on the beach-facing deck, or in the sands at the sit-down spot, Sand Coast; or at the large, corner terrace Anchorage Bar, where the food comes with gorgeous sea views. Sand Coast is presenting sand-sational beachside dining, where a wide range of light meals featuring influences from around the region makes it more fun than ever to dine by the Indian Ocean. Slip into the breezy casual ambiance on the sunny terrace or relax in the cozy open air hut, where salads, sandwiches, pastas, pizza, and Sri Lankan, Indian and Maldivian cuisine are served a la carte with beautiful ocean views on the side. Sea Salt - From the al fresco private lagoon setting to the finest selection of seafood and meats cooking over dramatic lava stone and charcoal grills, the views at Sea Salt are always spectacular. At live cooking stations, chefs barbeque locally caught fish, lobster and shellfish and prime steaks and other imported meats the way you like it, with fiery flair to match! With an ever-changing menu that's always at its freshest and most diverse, delectable desserts top off the experience. Baan Thai - Thai chefs – some of the finest in the Maldives – recreate the exotic flavors and traditions of their fascinating homeland, an irresistible blend of sweet and savory accented by pleasant citrus tangs and exciting spices. Baan Thai's noodles, rice plates, curries, soups, stir-fries and salads are customized to your taste – always authentic, whether mild or spicy. Aanchorage Bar - The best spot to view the sunset every evening is also the sweetest spot in the resort for drinks and snacks throughout the day, featuring signature cocktails. Watch bartenders perform mixology magic against a panoramic backdrop of the Indian Ocean, as live music on Saturdays set the rhythm for sun-soaked fun. Teppanyaki Hut features Japanese outdoor dining experience. The abstract gastronomical haven appears to be the Teppanyaki Hut facing the Indian Ocean and let our talented Teppan Chef showcase his creativity that will make this delicious culinary experience more special with our 6 unique islets serve as your background and a selection of sake to compliment the menu of your choice. T-For Tea House - Enjoy from a delectable selection of hot and cold refreshments, exotic teas, freshly prepared juices and cocktails anytime throughout the day. The T-For Tea House serves tangy asian flavours from freshly prepared chinese dim sum, noodles, pastries, light snacks to a stunning selection of exotic teas from different parts of the world. The resort's all-inclusive package includes breakfast, and lunch and dinner at Feast, Sand Coast, Anchorage and Beach Bar restaurants, along with unlimited draught beer, house wines by the glass (red, white, rose), sparkling wine, house pouring spirits, mineral water, and soft drinks between a set time that is inclusive of most of the day and night. Premium booze is extra and there is a dining credit for use at restaurants outside those included in the plan. Sheraton Maldives is home to the first of the Shine Sheraton signature spas. Set on its own islet and accessible by wooden bridges this state of the art and mostly outdoor spa has treatment rooms with showers and toilets in the open air, and with open fourth walls that face directly to the ocean. The interior of the dressing rooms is compact, but has such basic elements as lockers, a small dressing area, a steam room, a sauna and a hydromassage. Outside you will spot a swimming pool with hydrotherapy, sun loungers overlooking the sea and a landscape pond - a favorite watering place among the local herons. The spa also has a yoga studio with separate classes, and a relaxation room with agronomic soft sun loungers, overlooking the garden through glass windows, where hot ginger tea is offered and soothing music plays. If you like the cosmetic products used for your treatment, they can be bought at the spa boutique. Once you have made yourself at home on the island you have a range of options to make your idyllic island adventure complete. As for snorkeling - you will not find much underwater around the island, so this resort is really about the pleasures of the senses: the sun and water on your body, the spa treatments, the great food, luxurious surroundings and attentive service. Sheraton Full Moon is also for lovers. Honeymooners take up many of the over-water rooms and they are equally well catered for. The days are quiet and so too the evenings, except for Saturday when a DJ livens things up. There is also a wonderful beach party with a firepit, barbecue food, and a bodu beru band that draws the guests in and ignites a memorable evening. For more active there are fitness, water sports, and diving. Filled with branded modern cardio equipment, Sheraton Fitness is the place to sweat with iron, free water, balls, and mats. Outside there is a tennis court and ping-pong tables. In water sports center expect a handful of non-motorized facilities like windsurfing, kayaking, banana riding, and snorkeling equipment for free. If you want to try diving or book a snorkeling excursion, check the resort's dive center located on the beach in the far corner of the island next to the meeting pavilion. As for parents and children - "Sheraton Adventure Club". The allocated space for kid's activity is free of charge for children from four to 12 years old with a games room, exciting programs, crafts, feeding fish, and an open playground with children's slides, a station for building sand castles and other entertainment. Located between the pool and the lobby are the resort's boutiques, from fine jewelry to souvenirs and conveniences, and Link@Sheraton (a TV room/media and book library/internet cafe). It can get packed in here, especially with only one TV, a few Microsoft computers, and somewhat limited seating. There's also free internet and free gold cart shuttle rides around the island. 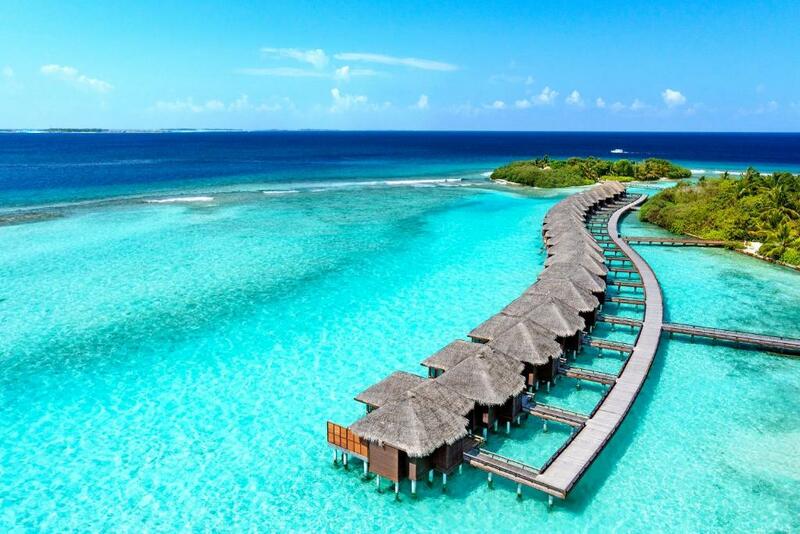 Considering that this is one of the more affordable luxury resorts in the Maldives, reviews for the Sheraton Maldives Full Moon Resort & Spa are Very Good. Nearly everyone praises the rooms as well as the service and the food. A few guests mention that the food and drinks are expensive, however they are likely even more expensive at most other resorts, so it's a matter of accepting that this is not a budget destination. Most were quite happy with the exellent location, since the resort is the closest to Velana airport, only a 15-minute speedboat ride away from Male, though a few guests mention that you can see a bit of industrial Maldives nearby, landing/departing aircraft and it's not as secluded as they might have preferred. Overall this resort does very well with reviews and many detail how happy there were during their stay, and should be a solid choice for a honeymoon or even a family holiday. High-class rooms and villas. Inside there are bathrobes, a mini-bar and a separate outdoor area. Excellent swimming pool with a waterfall, children's pool and plenty of sun loungers.